The symbolic pendant designs from artist K Robins at K Robins Designs make unique and meaningful jewelry gifts. K’s designs are reflections of her own personal journey – the people she has known, her passions and interests, and her joys, struggles and transitions. 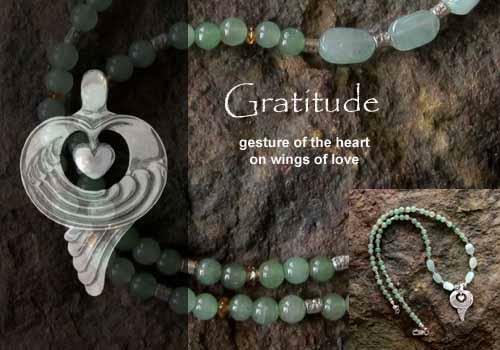 During her career over the past twenty five years, K has created more than 100 designs – Loving Kindness, Compassion, Wave, Tree, Owl, Lotus, Friendship Knot, Radiance, Balance, Changer, Butterfly, Journey, Barefeet, Mermaid, Joy, Flaming Chalice, Peace Prayer and many more. One of K’s greatest joys has been to hear so many beautiful heart-warming stories about what her pieces have meant to those who have worn or received them. Many of those stories are shared on her website under the descriptions of the designs. The original designs have been hand carved (using the Lost Wax casting process) by K Robins and then cast in sterling silver or 14K gold. Each design comes with its own unique poem that describes its origin or essence. 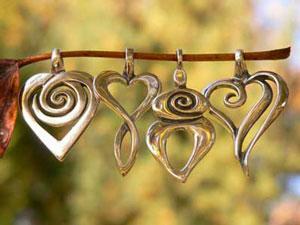 Pictured below are Spiral Heart, Infinite Love, Healer, Loving Kindness by K Robins. 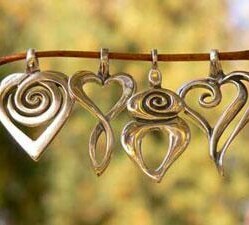 Giving someone a piece of symbolic jewelry is a unique way of telling the recipient that he/she is honored in a special way. Celebrating love with a heart, showing thanks with a piece that embodies compassion, joy, or gratitude, sending a graduate off with a piece that speaks of a journey or a butterfly, sharing friendship with a friendship knot, recognizing nature and its importance in one’s life, acknowledging one’s spiritual path. Artist K Robins has created a graceful line of silver and gold pendants and earrings that reflect life – its diversity and connectivity. What are some of the ways you’ve given a jewelry gift to represent something symbolic? love the heart charms. Do you sell them?